“We were looking for inflow and infiltration sources (specifically ground water infiltration) and to schedule a CCTV crew to be here when conditions are right is extremely difficult, if not impossible. The pole camera showed certain areas to be in good working order so we could move them to the bottom of the list for repairs. Currently we are in a sanitary sewer evaluation study and may use CCTV to investigate some problem areas in the future.” -- Scott Hunsucker, plant superintendent, Town of Brownstown. Does this sound familiar? Do your sanitary sewers need to be inspected because you are experiencing inflow and infiltration (I/I) issues within your system? With a limited budget and time constraints, televising every sanitary sewer line may not be feasible. In the time it would take you to get a Starbucks’ coffee (no more than 10 minutes), pole camera investigations could provide a clear video of your community’s storm or sanitary sewer line at a fraction of the cost of CCTV. With the introduction of the new haloptic quick view camera (aka pole camera), you can quickly and cost-effectively inspect your sanitary and storm sewers to identify structural deficiencies and pinpoint active I/I, identifying sewers that require further evaluation and potential rehabilitation. The pole camera combines an optical zoom camera with a haloptic light source that projects a halo shaped column of light conforming to the sewer line. The result is clear, digital video of conditions within the pipe as far as 150 feet into an 8-inch sewer. 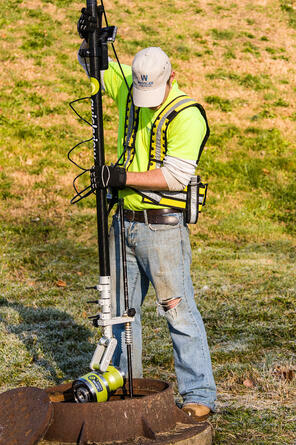 Using a pole camera to perform sewer inspections is a great way to investigate sewer segments of concern to get a quick assessment of each line. You will then have a better idea of whether or not the line is in bad enough shape to justify further evaluation expenses or looks OK and can be placed at the bottom of your priority list. This will allow you to use your limited financial resources to your best advantage. 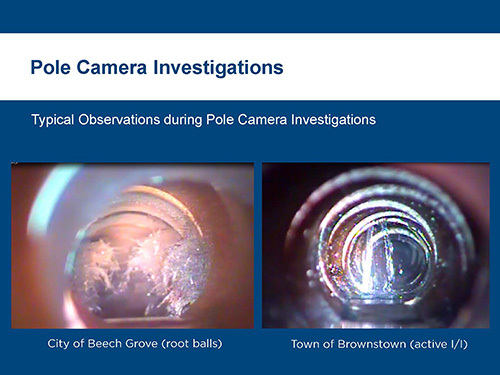 Phil Gurganus, sewer supervisor, indicated the City of Beech Grove chose the pole camera to save money and time. They spent far less money to identify their most troublesome areas, and they were able to schedule the work (in this case, with Wessler) in a matter of days compared to the weeks it normally takes for a CCTV crew to be available. Phil believes the money you can save by using the pole camera first is well worth it; you can then apply those savings toward further investigation by a CCTV crew in areas where it is warranted. The pole camera is a valuable tool to provide a quick and economical assessment of needed information – or snapshot - of the the conditions that are causing problems in your sewer system. Are there any disadvantages to using a pole camera vs. CCTV? Absolutely! Since the pole camera doesn’t travel through the sewer, you are unable to see beyond bends, offset joints or vertical/horizontal curves. Spider webs, steam or fog could potentially obstruct the pole camera view. This would not be a problem for CCTV because it cleans and travels through the sewer. “I still feel even knowing that [the disadvantages] the pole camera is a valuable tool to safely, quickly, and economically gather needed information regarding the conditions that cause problems in our sewer system”, said Phil. The pole camera is not a replacement for CCTV. It is a valuable option to consider when inspecting your sanitary sewers, allowing you to assess larger sections of your system and prioritize future efforts.